Vol-au-vent translates into English as ‘waft of air’ as these tasty little canapés are light and eaten in a second. Often associated with 80s dinner parties along with the Black Forest gâteau, we think the vol-au-vent is due for a revival. Vol-au-vents are best known for being filled with a creamy mushroom or salmon filling, but your flavour need not be restricted to the 1980s. 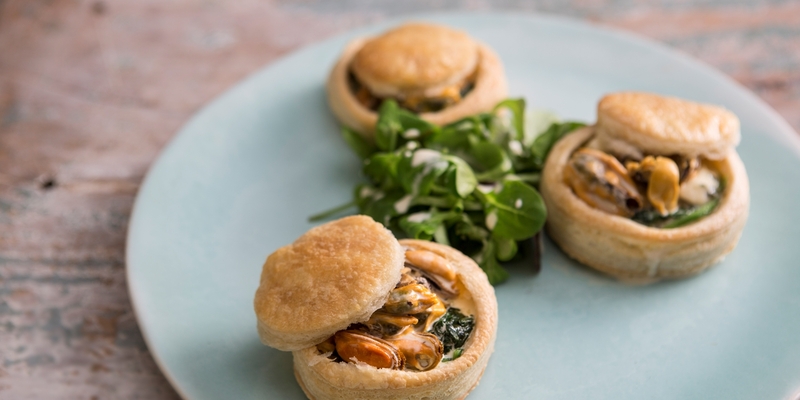 Mark Dodson serves Wild mushroom, spinach and goat's cheese vol-au-vents with poached duck egg and pimento and Colin McGurran opts for a simple sausage and marmalade in his vol-au-vents.